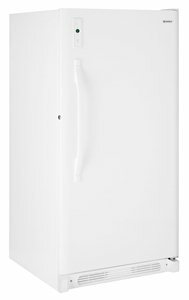 The Kenmore 28052 upright freezer is an enormous, feature-rich upright freezer with a small price tag. It's hardly surprising then that it's one of the hot Kenmore upright freezers. So, why do shoppers love to pick up this freezer model from Sears? With everything from a large capacity, an automatic defrost system, digital controls, to a lock and temperature alarm, it is a great buy for a family that loves to dabble in high-tech appliances without breaking the bank. But to understand why this freezer has a large legion of fans, we need to appreciate the benefits that its raft of features bestows. As with all large appliances, it's always a good idea to be sure that a freezer will fit in your kitchen (or wherever you want to place it) before making a buying decision. Depth with door open 90 degrees: 59-3/8"
It's also a bestseller and is a good choice if you're looking for a tried and tested medium-sized upright freezer. The Kenmore 28052 offers 20.6 cu. ft. of freezer space. That's large enough to store more than 700 lbs. of frozen food. To put this in perspective, this freezer can hold well over 1,000 large skinned chicken breasts. So, it offers loads of space, whichever way you look at it. So how can you put this large capacity to work for you? Mostly by saving money when you shop in bulk, eat in and eat out less. And time when you reduce your shopping trips and sneak in plenty of freezer cooking. Because it's easy for food to lie forgotten in hard-to-reach corners, a large freezer is only really as good as its storage options. So how does the Kenmore 28052 stack up? The 4 fixed, sturdy wire shelves account for most of the freezer's storage space. The slide-out basket is the place to keep small items that would never sit still on the wire shelves. And thankfully, it's a single basket, so there's only one place to rummage for that elusive crushed garlic punnet. There's nothing quite as bad as salivating over the burger you're certain you stored on the top shelf, only to find that some unauthorized person beat you to it. If you have little ones or some visit often, a lock keeps the freezer from turning into a safety hazard. Not having to bend, lift, squat, or mop up a mess just to make sure your appliance is working optimally. Thankfully, the manufacturers of the Kenmore 28052 thoughtfully made it a frost free upright freezer. Specifying key parameters with high precision. And this freezer is not wanting in this respect either. It's equipped with digital controls for setting temperature and alarm thresholds. Reliable safeguards against loss of your investment. Here too, this Kenmore freezer rises to the occasion. It has a temperature alarm that sounds and flashes to alert you that the interior temperatures are rising, or that the door has been accidentally left ajar. So you can sleep soundly in the confidence that you will be alerted if something is amiss. Peace of mind. Kenmore stands behind its quality commitment with a whole year's warranty on parts and labor. In plain English, Kenmore undertakes to, at their cost, remedy defective parts and labor which existed at the time of the purchase. For the average American family, finding the right freezer at the right price can be a daunting task. So yeah, price is often a deal breaker. 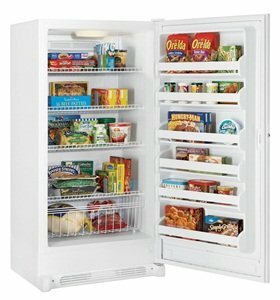 Are you on a budget but are looking for a time-tested freezer to help you save both money and time? Well, you can take heart in knowing that the rave reviewed Kenmore 28052 is one of the cheaper 20.6 cu. ft. freezers on the market today. And, even though the recommended retail price is $909.99, you could get this for up to 30% off with the discount coupons that we offer occasionally. That way, it pays for itself in a much shorter time. The Kenmore 28052 combines a series of benefits that appeal to a discerning foodie. These benefits include low cost, frost free operation, huge storage capacity, versatile food organization, lock and keys, and a temperature alarm. It is little wonder that the Kenmore 28052 is the model of choice for thousands of Americans who are looking to invest in a large Kenmore upright freezer.